We don’t know who embraced Rahab and insisted the other women welcome her as well. What we do know is that just as Rahab provided a safe place for the spies, someone created a safe place for Rahab the Harlot. This story challenges me to ask myself if I am creating a safe place "in the camp (church)" for Rahab today just as Jesus creates a safe place for me. Oh, that I will be the one who embraces the broken woman whose lifestyle is different than mine but whose heart resonates with the same need for Jesus. Joshua 6:25 feeds my imagination with the words "...and she lived in Israel to this day." This passage begs the question, “What Rahab’s live among the children of God today?” Is there a Rahab in my life who needs to feel the safety of living among God’s people? What is her story, how does God want her story to deepen my own faith? Let’s dig deeper and be honest. Each woman “in the church” is Rahab the Harlot, hopelessly lost without Jesus. I am Rahab. You are Rahab. Surely, the grace I have received compels me to open wide the doors of God’s local church to welcome every Rahab who longs for forgiveness and redemption. Review Today’s Treasure and imagine Rahab starting her journey with God by declaring that from this moment forward she would claim Him as her protector, her shield, her safe place. No doubt God kept the promise of protecting her by placing her in the middle of the Israelite family. Ask the Lord to direct you to a church, a small group, a friend with whom you can share your story and your choice to embrace the Lord as your protector, shield, and safe place. Read Chapter 2 in Harlots and Heroines to dig deeper into the life of Rahab. Note other personal lessons Rahab teaches through her life. Let this “Midwife of the Messiah” help turn your heart toward Jesus! At some point in our lives, we or someone we know will go through great suffering. In those moments of suffering, we need the encouragement of knowing how Christ and the hope of the gospel can not only meet us in our pain but equip us to encourage others. 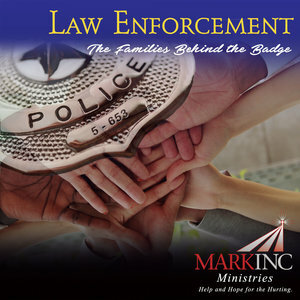 I encourage you to listen to this Law Enforcement audio resource so that you can store up treasures of encouragement for the next rainy day in your life or someone else's.